Babylonian amora of the fourth generation; pupil of Rabbah bar Naḥmani and a colleague of Abaye, who was of the same age and had been his fellow student (Ber. 48a, according to the correct reading; comp. Rabbinowitz, "Variæ Lectiones"). 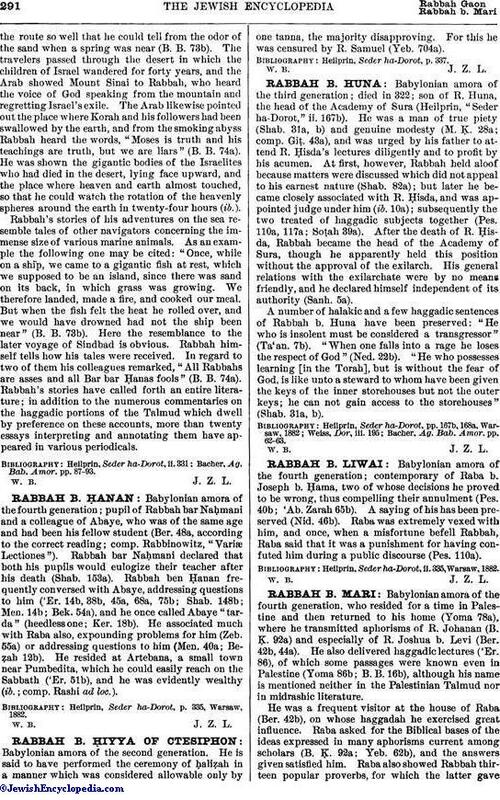 Rabbah bar Naḥmani declared that both his pupils would eulogize their teacher after his death (Shab. 153a). Rabbah ben Ḥanan frequently conversed with Abaye, addressing questions to him ('Er. 14b, 38b, 45a, 68a, 75b; Shab. 148b; Men. 14b; Bek. 54a), and he once called Abaye "tarda" (heedless one; Ker. 18b). He associated much with Raba also, expounding problems for him (Zeb. 55a) or addressing questions to him (Men. 40a; Beẓah 12b). He resided at Artebana, a small town near Pumbedita, which he could easily reach on the Sabbath ('Er. 51b), and he was evidently wealthy (ib. ; comp. Rashi ad loc.). Heilprin, Seder ha-Dorot, p. 335, Warsaw, 1882.